Former President Barack Obama mimics a person taking a selfie as he kicks off a two-day summit in the South Loop. He said he doesn't allow people to take selfies with him. SOUTH LOOP — If you came to Barack Obama's two-day Chicago summit hoping to snap a selfie with the former president — you might want to rethink your plans. "For Michelle and myself, no selfies," Obama said. "This seems trivial, but it's not. One of the weird things about being president is I found people were no longer looking me in the eye. "They approach me either like this," Obama said, waving his arm in the air to mime someone taking a selfie, "or like this," he continued, turning his arm to snap another fake shot. 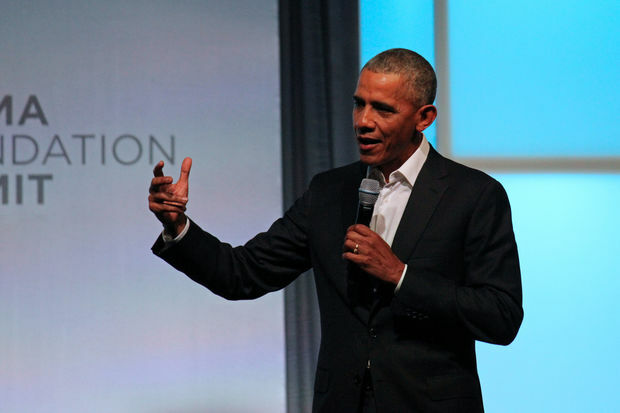 Obama spoke Tuesday at the Marriott Marquis, 2121 S. Prairie Ave., where young activists and community leaders from more than 60 countries had gathered for the Obama Foundation Summit. "To see young people organizing in states all over the country through social media is amazing," Obama said. "But [if you are] blocking yourself from having a conversation or seeing somebody and recognizing them and listening to them because you are so busy trying to get a picture ... then you are, I think, in some ways, contributing to what separates us rather than trying to break through" to other people. "It will also allow Michelle and me to have actual conversations with you, which will be nice," Obama quipped. The two-day summit is Obama's largest event in Chicago since leaving the White House. It includes keynote speeches from Michelle Obama and Prince Harry of Wales and a concert at the Wintrust Arena headlined by Chance the Rapper. The summit is the first major event articulating Obama’s post-presidential mission to promote civics and get young people engaged in building more equitable and inclusive communities.